There are many passages in the Bible that bewail the seeming prosperity of ungodly, rich tricksters while the people of God seem to be mercilessly exploited and defrauded by them, in every area of life. But James addresses the issue of social justice in this part of his epistle and he does not pull his punches as to his severe denunciation of their immoral ways.. while outlining the fatal, final outcome of their iniquitous lives. 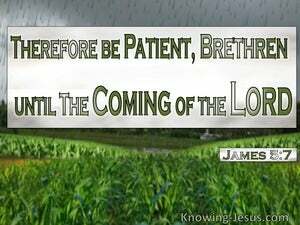 James starts to bring his letter to a close with an exhortation to patience: "Therefore, be patient, brethren" he pleads, "be patient until the coming of the Lord. Be patient like the farmer who waits for the precious produce of the soil and remains patient, until the field receives the early and late rains". 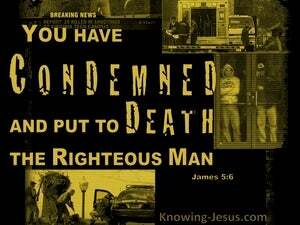 The apostle James touches on many issues that affected persecuted Christians in the early church. 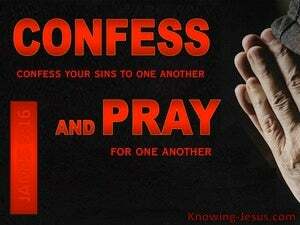 Topics in James relate to the unity in the Body of Christ as well as faith, wisdom, conflict, justice and prayer. 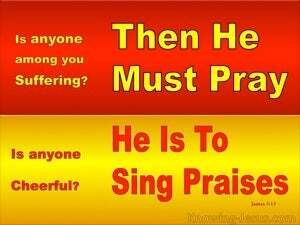 Prayer and praise are two vital elements in the Christian life, and yet they are perhaps the two essential components of a believer's spiritual walk, that are most frequently lacking. Prayer is a great privilege for the Christian for it affords us an audience at the throne of grace.. for mercy to find help in time of need. 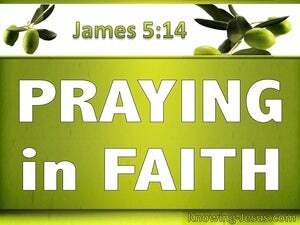 And the book of James both begins and ends with the “prayer of faith'. As James draws his epistle to a close, we are called to confess our trespasses to one another and to pray for each other, knowing that the effective prayer of a righteous man can accomplish much.